A love story that lasted more than 15 years came to an end a little after 14:30 CET Saturday 14 February, on St Valentine’s Day, when the ATV-5 Georges Lemaître undocked from the International Space Station. Replay the live broadcast of the event here. This was the last chance we would get to see pictures of the ATV in flight. 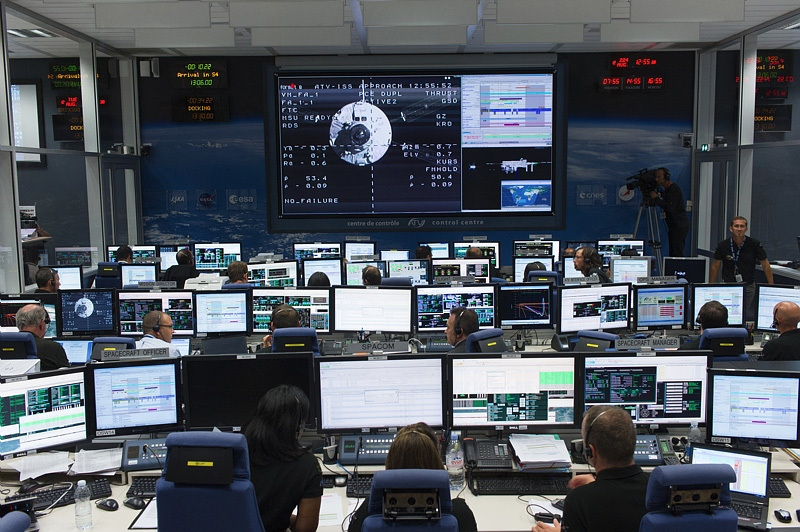 CNES began work on the Automated Transfer Vehicle Control Centre (ATV-CC) back in 1998. The first ATV, Jules Verne, was launched in 2008 and each flight since has brought new operating challenges for the ATV-CC teams at CNES in Toulouse. But every programme comes to an end. The ATV Control Centre at CNES in Toulouse. Credits: CNES/M. Pédoussaut, 2014. With the five ATV resupply vehicles, ESA-CNES teams have shown their ability to conduct highly complex operations in space, during docking, phases when the vehicles were berthed to the station (unloading cargo into the ISS or raising its orbit), undocking and controlled re-entry as they burned up in Earth’s atmosphere. The undocking of ATV-5 proved somewhat special for two reasons: it was the last such operation and this time teams had to work around a fault on the vehicle. One of its power chains had been failing to respond for several days and even though all the ATV’s systems have built-in redundancy, today’s sequence of operations was executed with extra care (a second fault could have compromised subsequent mission operations). The vehicle will re-enter the atmosphere late Sunday afternoon, 30 hours after undocking. The ATV and the 2 tonnes of waste it is carrying from the ISS will then burn up. After 6 months with the ATV berthed to the station, the ATV-CC will be running through its usual routine. A ‘shallow dive’ had been planned with NASA to simulate the future re-entry profile of the ISS, but for this conditions had to be ideal. The decision to fly a standard re-entry profile was reluctantly taken this week. Sometimes space is a tough game. Here is a time-lapse sequence showing the ATV’s departure compiled from photos taken by ISS crew member Terry Virts from the station. See the photo gallery of the undocking as viewed from the ATV-CC at CNES in Toulouse.